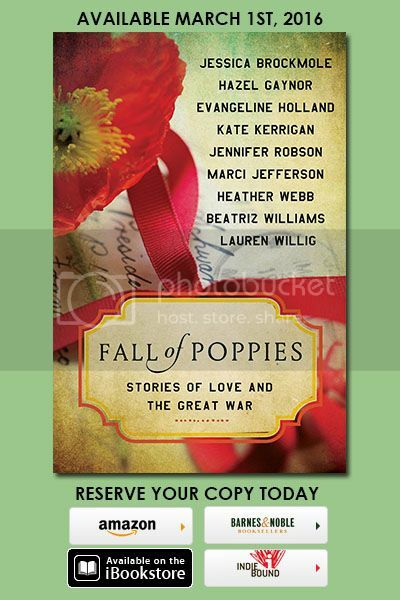 Cover Reveal: Fall of Poppies: Stories of Love and The Great War featuring stories by Lauren Willing, Heather Webb and More!! Giveaway too! ~ Love.Life.Read. Cover Reveal: Fall of Poppies: Stories of Love and The Great War featuring stories by Lauren Willing, Heather Webb and More!! Giveaway too! Top voices in historical fiction deliver an intensely moving collection of short stories about loss, longing, and hope in the aftermath of World War I—featuring bestselling authors such as Hazel Gaynor, Jennifer Robson, Beatriz Williams, and Lauren Willig and edited by Heather Webb. survivors, the smoke is only beginning to clear. Picking up the pieces of shattered lives will take courage, resilience, and trust. Within crumbled city walls and scarred souls, war’s echoes linger. But when the fighting ceases, renewal begins…and hope takes root in a fall of poppies. Beatrix whisked around the showroom, feather duster in hand. Not a speck of dirt could remain or Joseph would be disappointed. The hour struck noon. A chorus of clocks whirred, their birds popping out from hiding to announce midday. Maidens twirled in their frocks with braids down their backs, woodcutters clacked their axes against pine, and the odd sawmill wheel spun in tune to the melody of a nursery rhyme. Two dozen cuckoos warbled and dinged, each crafted with loving detail by the same pair of hands—those with thick fingers and a steady grip. Beatrix paused in her cleaning. One clock chimed to its own rhythm, apart from the others. She could turn them off—the tinkling melodies, the incessant clatter of pendulums, wheels, and cogs, with the levers located near the weights—just as their creator had done before bed each evening, but she could not bring herself to do the same. To silence their music was to silence him, her husband, Joseph. The Great War had already done that; ravaged his gentle nature, stolen his final breath, and silenced him forever. In a rush, Beatrix scurried from one clock to the next, assessing which needed oiling. With the final stroke of twelve, she found the offending clock. Its walnut face, less ornate than the others, had been her favorite, always. A winter scene displayed a cluster of snow-topped evergreens; rabbits and fawns danced in the drifts when the music began, and a scarlet cardinal dipped its head and opened its beak to the beauty of the music. The animals’ simplicity appealed to her now more than ever. With care, she removed the weights and pendulum, and unscrewed the back of the clock. She was grateful she had watched her husband tend to them so often. She could still see Joseph, blue eyes peering over his spectacles, focused on a figurine as he painted detailing on the linden wood. His patient hands had caressed the figures lovingly, as he had caressed her. The memory of him sliced her open. She laid her head on the table as black pain stole over her body, pooling in every hidden pocket and filling her up until she could scarcely breathe. “Give it time,” her friend Adelaide had said, as she set a basket of jam and dried sausages on the table; treasures in these times of rations, yet meager condolence for what Beatrix had lost. “Time?” Beatrix had laughed, a hollow sound, and moved to the window overlooking the grassy patch of yard. The Vosges mountains rose in the distance, lording over the line between France and Germany along the battle front. Time’s passage never escaped her—not for a moment. The clocks made sure of it. There weren’t enough minutes, enough hours, to erase her loss. As quickly as the grief came, it fled. Though always powerful, its timing perplexed her. Pain stole through the night, or erupted at unlikely moments, until she feared its onslaught the way others feared death. Death felt easier, somehow. Beatrix raised her head and pushed herself up from the table to finish her task. Joseph would not want her to mourn, after two long years. He would want to see her strength, her resilience, especially for their son. She pretended Adrien was away at school, though he had enlisted, too. His enlistment had been her fault. A vision of her son cutting barbed wire, sleeping in trenches, and pointing a gun at another man reignited the pain and it began to pool again. She suppressed the horrid thoughts quickly, and locked them away in a corner of her mind. With a light touch she cleaned the clock’s bellows and dials, and anointed its oil bath with a few glistening drops. Once satisfied with her work, she hung the clock in its rightful place above the phonograph, where a disk waited patiently on the spool. She spun the disk once and watched the printed words on its center blur. Adrien had played Quand Madelon over and over, belting out the patriotic lyrics in time with the music. To him, it was a show of his support for his country. To Beatrix it had been a siren, a warning her only son would soon join the fight. His father’s death was the final push he had needed. The lure of patrimoine, of country, throbbed inside of him as it did in other men. They talked of war as women spoke of tea sets and linens, yearned for it as women yearned for children. Now, the war had seduced her Adrien. She stopped the spinning disk and plucked it from its wheel, the urge to destroy it pulsing in her hands. She must try to be more optimistic. Surely God would not take all she had left. To Celebrate Fall of Poppies gorgeous cover, William Morrow is giving away print Copies of After The War is Over, A Memory of Violets, and Land of Dreams to celebrate FALL OF POPPIES (William Morrow, March 2016). Be sure to enter below! !